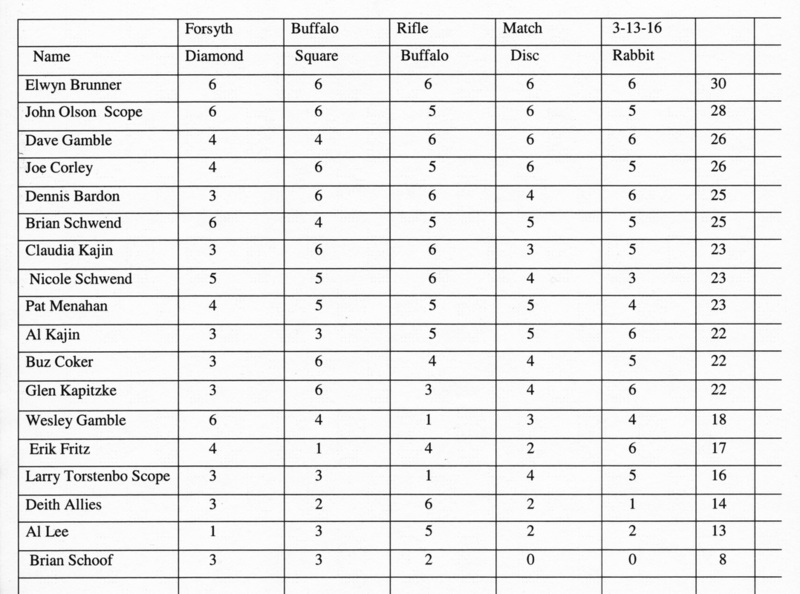 There are four regular monthly matches held by the Forsyth Rifle and Pistol Club that may be of interest to black powder cartridge rifle shooters. You are certainly welcome to join us for any of them if you are in the area. Held the third Sunday of each month starting at 10 AM at the silhouette range at Bruce Shaver's northwest of Forsyth. 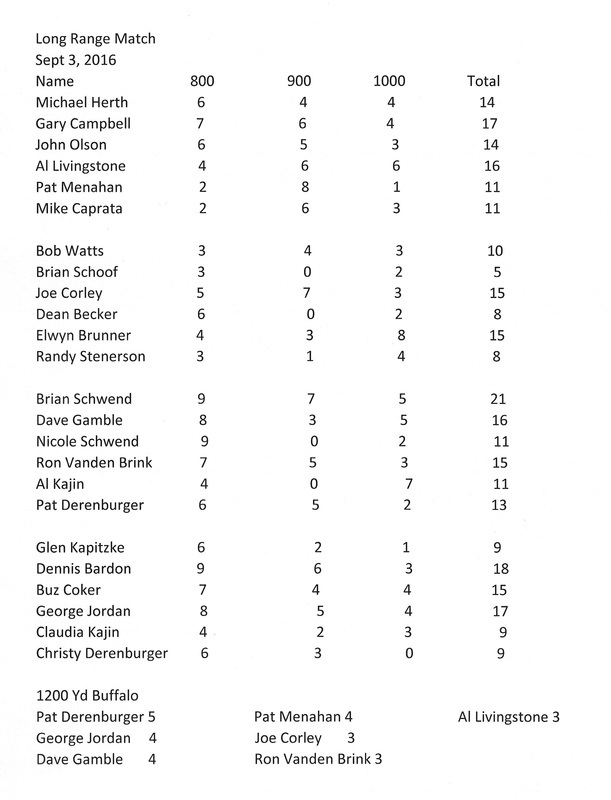 This is an NRA regulation match of 40 shots for score. For directions or information contact Rick Smith at 406-346-2315 or 406-351-1925 (cell). Held the second Sunday of each month starting at 1 PM at the club range on Lee Ranch north of Forsyth. The range is west of the Quigley range at the foot of the hill. There are eleven targets at ranges from 300 to 650 yards. 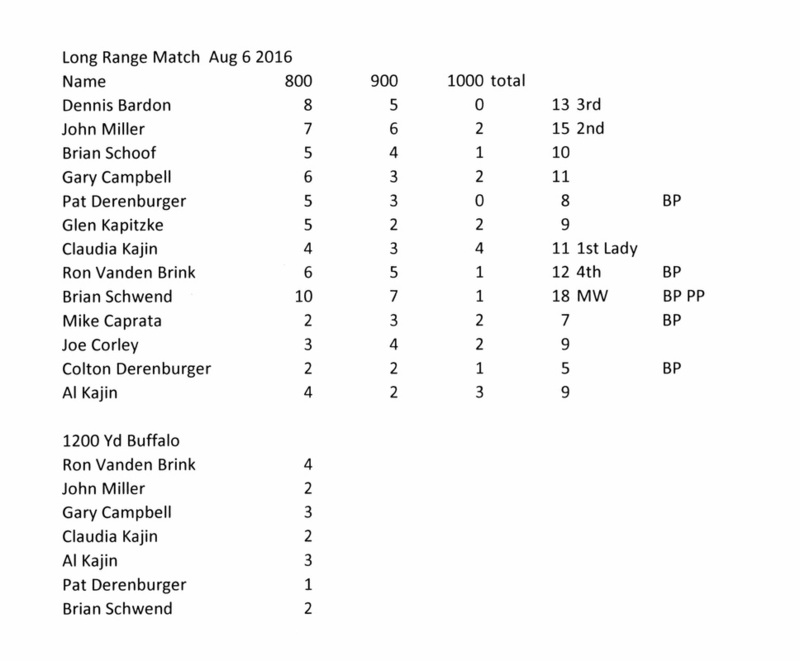 Four targets are selected by drawing and the 650 yard buffalo silhouette target is included in each match. One sighter and six shots for score are fired at each of the five targets in the sitting cross-stick match. If you prefer some off-hand shooting you can take 2 sighters, three cross-stick shots for score and two off-hand shots for score. For directions or more information contact Al Kajin at home: 406-346-2442 or cell: 406-201-0317. Held the Saturday before the 1st Sunday of each month starting at 1 PM at the 1,000 yard range on Lee Ranch north of Forsyth. The range is 400 yards behind the Quigley firing line. There are three targets, one each at 800 yards, 900 yards and 1,000 yards. 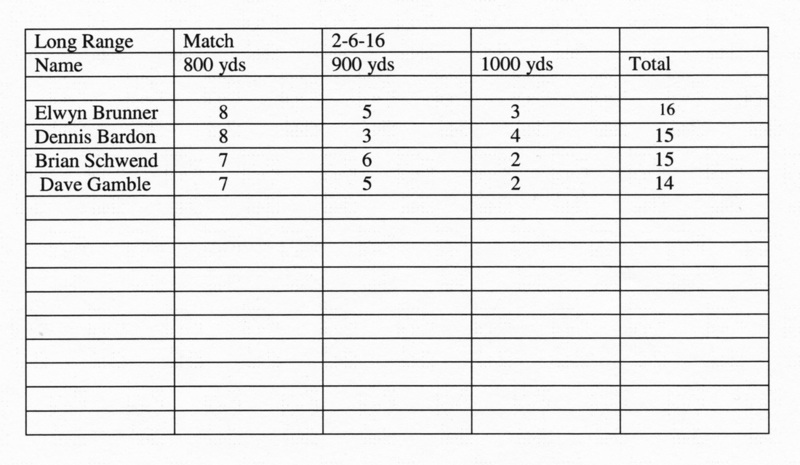 Two sighter shots and ten shots for score are taken at each target during the match. 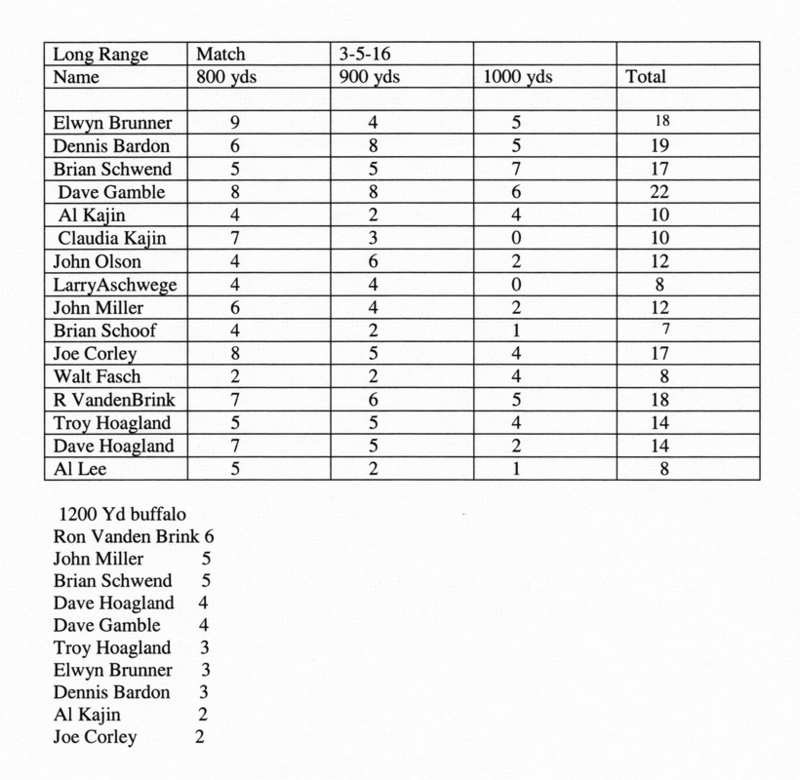 Following the formal match is a 1,200 yard side match shooting at the Quigley buffalo. Same format with two sighter shots and ten shots for score. All shots are fired with cross-sticks in the sitting or prone position. For directions or more information contact Brian Schwend at 406-346-7129 or Wes Gamble at 406-342-5368 or 406-351-2668. Held the fourth Sunday of each month starting at 1 PM at the long range .22 range on Lee Ranch north of Forsyth. The range is located at the turn off for the 1,000 yard range. There are eight targets at ranges from 190 to 350 yards. 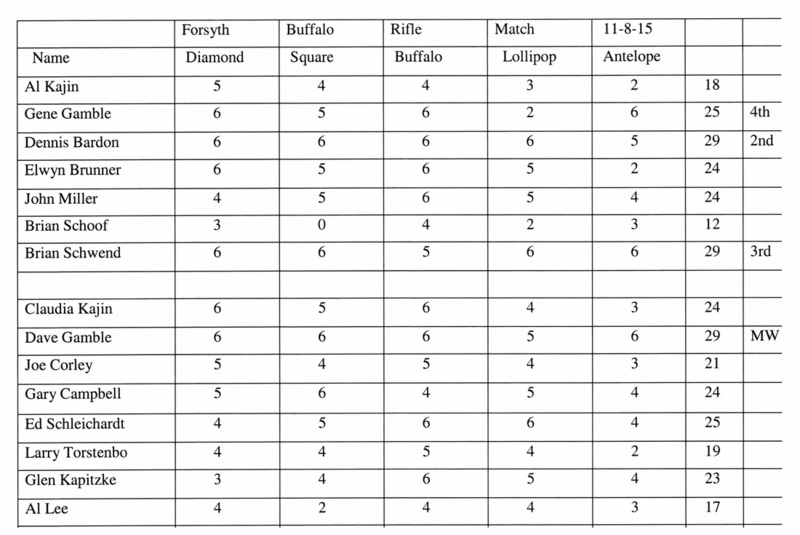 The targets for the match are determined by a coin flip with the 350 yard buffalo silhouette target always included. Course of fire is two sighters and eight shots for score on each of five targets. This is a sitting cross-stick match. For directions or more information call Trent Pfaffinger at home: 406-342-5408 or cell: 406-670-6154.